No amount of sweeping or vacuuming seems to affect the endless wave of pet hair that attaches to every surface in your home. Try as we might, shed happens! Shedding season brings even more pet hair tumbleweeds and while these seasonal transitions aren’t fun for anyone, it’s a natural and healthy part of your pet’s skin and coat health. If you have a heavy shedding pet, then you should check out Top Pet Hair Removal Tools to help de-fur your house. Dogs and cats shed, just like you and me, but there are some habits and routines that will help minimize excessive shedding in pets. What you put into your pet affects what comes out, and we’re not talking about poop this time. Their skin and coat health is dependent on a wholesome balanced diet, rich with natural vitamins, minerals, and omega fatty acids. 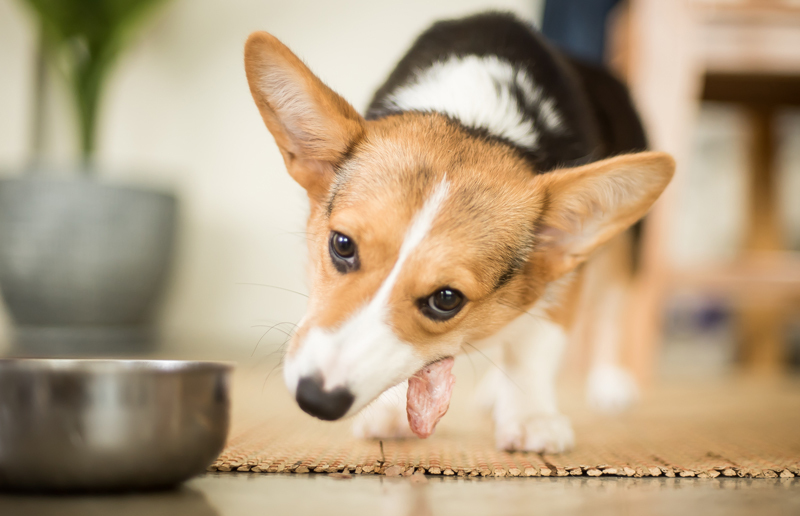 Benefits of a healthy diet can be seen throughout many aspects of your pet’s health, and skin and coat is a good indicator of health. Omega 3 and 6 fatty acids as well as many vitamins and minerals aid in skin and coat health, by conditioning their skin and promoting healthy cell development. Many common skin issues can be related to poorly balanced diets, or synthetic and poorly digested nutrients. Switching to a higher quality diet can reduce dry and itchy skin, as well as excessive shedding. During shedding seasons, you can aid further by supplementing fish oils and fresh produce to supply these key nutrients in a natural and digestible format. Even though it’s important to stay on top of your pet’s grooming during shedding seasons, they actually shed all year long. Routine grooming practices help keep their skin and coat healthier and prevent matting, tangles, and breakage. Depending on the type of hair that your pet has, grooming is recommended at least weekly, but try to get as close to daily as possible. This will collect dead, loose hair that is just waiting to jump onto the couch or your clothing. Regular grooming practices will also help desensitize your pet to the grooming process. Many pets fear brushes, especially if they get groomed infrequently. While many cats like the feeling of the brush, they still need time to get used to the process. Start slow and try to incentivize the session with treats, toys, petting, or verbal praise. 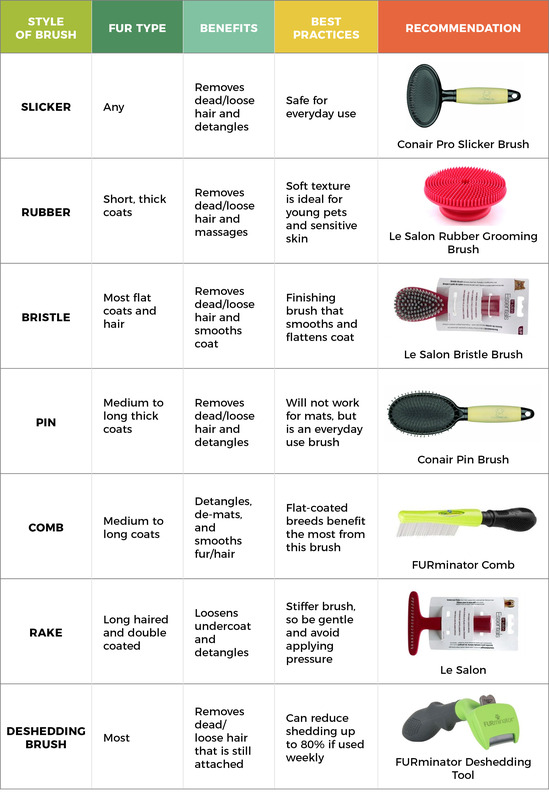 There are many options for dog and cat brushes, so check out this chart to get an idea of which brush might be appropriate for your dog. Deshedding sounds pretty straight forward, but there are some best practices that you should be aware of before you get excited and dive right in. Firstly, you can over groom your pet. While many brushes are designed for everyday use, deshedding is best used in moderation. Weekly is ideal for most pets, occasionally more often during high shedding periods and with double coated breeds. Many deshedding tools are designed to not only remove loose hair, but also gently pull out dead hair that may still be attached to the follicle. This doesn’t hurt your pet when used routinely, but using this type of brush too often can result in the brush pulling out live and healthy hair, which can be not only painful but can damage the fur and skin. Before you start deshedding your pet, go over them briefly with a standard brush, like a slicker, pin or comb style brush. This will remove loose hair and detangle in preparation for the deshedding tool. Another important thing to remember when you are deshedding is that these brushes don’t require a lot of force. If you encounter knots or tangles, stop. Keep a softer slicker brush or comb handy to work out tangles, and then proceed with the deshedding process. Use short gentle strokes with the deshedding tool and clean the hair out of the brush often. This will make the brush more efficient and ensure that your pet will be less intimidated by your grooming techniques. 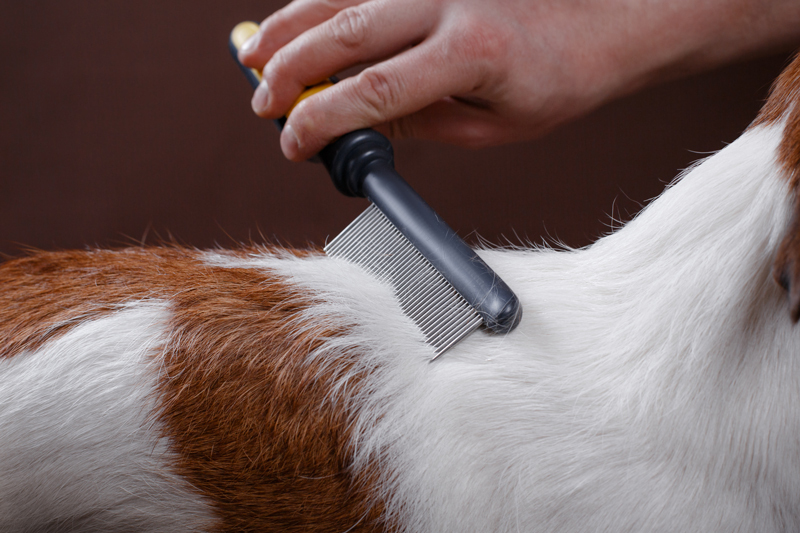 There are many brands that make deshedding tools for pets, but we have a favourite. 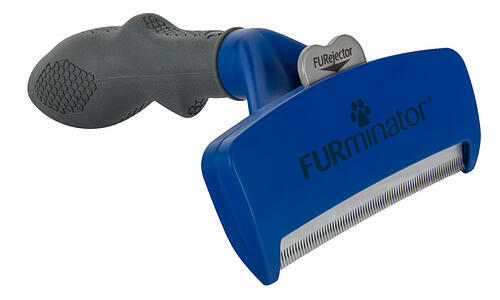 The FURminator deshedding tool stands out in the crowd of grooming tools and we recommend it for both dogs and cats. The FURminator deshedding tool, when used regularly and as directed, can reduce shedding up to 90%! For cats, this means fewer hairballs from self-grooming practices. The brushes are available for dogs, cats, small animals and any pet with an undercoat. It works by using stainless steel teeth that gently loosen and remove dead undercoat hair, without damaging their top coat. The fine teeth also remove dirt and debris that can easily get trapped in the undercoat. The curved edge design makes it smoothly glide across your pet's skin without discomfort or irritation. The easy Furjector button pushes out the collected hair for easy disposal. They, and we, are so confident that this brush will work that they offer a 30-day money back guarantee on all deshedding tools. If you don’t like it, just return it for a full refund. The FURminator deshedding tool is a necessity for furry households. You’ll be surprised at the amount of dead hair that your pet is carrying around just waiting to leave a trail wherever they go. We definitely recommend using this brush in an area that is easy to clean, like tile or even outdoor areas. For even more shed control, try the FURminator vacuum attachment to collect the hair as you brush them. So what are you waiting for? Reclaim your house from the fields of pet hair that are taking over, and give your pet a healthier, more beautiful skin and coat today! What’s your favourite deshedding tool? Let us know in the comments!